Richard of Bordeaux, was the son of Edward the Black Prince and the grandson of Edward III. Upon the death of Edward III, the 10 year old Richard was coronated on 16 July 1377. The farthing played an essential part of London life - particularly among the poor and in small everyday transactions. A farthing paid for: the toll for a laden horse to cross Holborn Bridge; the price of half a gallon of best ale; the cost of two red herrings; or the charge imposed by the city for every laden horse passing through the city gates6. While bartering for small purchases may still have worked in the countryside, in the city it was far more impractical. The Commons stated still further, in their petition, that certain weights for bread, and measures for beer, such as the gallon, pottle, and quart, were ordained by statute, and that they the said Commons had no small money to pay for the smaller measures, which was greatly injurious to them ; and therefore they prayed that it would please the king and council to command that halfpennies and farthings should be made in order to pay for the smaller measures, and other little purchases ; for God, and for works of charity ; and that the victuallers throughout the realm should be charged to sell their victuals answerably to the size of the money. This was promised to be done, as soon as the king could provide bullion for that purpose7. The Commons again represented the great inconveniences which the populace sustained from the want of halfpennies and farthings, with which they had been accustomed to pay a halfpenny for a halfpenny-worth of bread or beer, and a farthing for a proportionately smaller amount, yet such coinage has become rare throughout the whole of England, to their great loss. They therefore petitioned that such coins might be made, and circulated amongst the common people to their great relief, and that out of every pound weight coined there should be made 3s. 4d. in halfpennies and farthings, of the same weight and fineness as heretofore. John Lincoln, a goldsmith11 stated "that [a] great plenty of halfpennies and farthings should be made." And a prominent London merchant, John Hoo, stated "That the officers should be commanded to make a greater number of halfpennies and farthings, in order to supply the want of those coins. "12 From these statements, is not clear if the mint master was minting halfpennies and farthings in accordance with the indentures, but that so little silver was being coined that the percentage set aside for small change resulted in a negligable output. Or, was the mint master remis in carrying out his duties. In any case, the commons called for more small change to be produced yet no legislation was issued to increase the quantity. the reformist Lord Mayor of the City of London, John Northampton (also known as John Comberton in the writings of chroniclers playing on the word comber (trouble) in reflection of the trouble that opponents thought his policies caused London), issued an ordinance to assist the poor by ordering bakers to produce farthing loafs and brewers to sell ale by a farthing measure (the Mayor and Aldermen deeming ale as equally necessary to the poor as bread). To ensure that no baker or brewer could refuse to sell on demand that amount of bread or best ale, or fail to give change for a halfpenny, the Mayor sent off £80 to the Tower mint to be made into almost 77,000 farthings, for the Mayor to distribute at his discretion. Also the parsons of churches in the City refused to accept anything less than a halfpenny to say a prayer for the dead. The Mayor and Aldermen regarded this as extortion and passed an ordinance whereby the charge for a vigil was set at a farthing, and if the church failed to provide change for a halfpenny, then the citizen was free to leave without making any offering. the Mayor ordered all bakers, brewers, hostelers and hucksters (the latter two professions added to the list of monetary troublemakers) to come to the Guildhall by Thursday 16 May to purchase as many farthings as they needed to conform to the ordinance. The Commons stated, in their petition to the King, that whereas there had been great scarcity in the realm of halfpennies and farthings of silver, whereby the poor were frequently ill supplied, so that when a poor man would buy his victuals, and other necessaries convenient for him, and had only a penny, for which he ought to receive a halfpenny in change, he many times did spoil his penny' in order to make one halfpenny. And also when many worthy persons of the commonalty would give their alms to poor beggars, they could not, on account of the scarcity of halfpennies and farthings, to the great withdrawing of the sustenance of poor beggars. For this inconvenience the Commons prayed that a remedy might be found. 6 KENT, JPC. 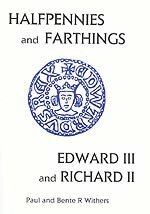 1987: 'An Issue of Farthings of Richard II' BNJ 57, p. 118. 11Lincoln is identified as "John Lincoln" in The Economic History Review, vol. 4, No. 1, Oct.